May 2016 – Special Offer! Offer is valid for a studio or a one bedroom apartment. Price applies for 2 adults for 1 week stay. In case of an extra person there will be an extra cost of 5 euros per day. If you are interested for longer stay please contact us. The entire accommodation cost should be paid in advance, in order for the reservation to be valid. In case of cancellation there will be no refund. 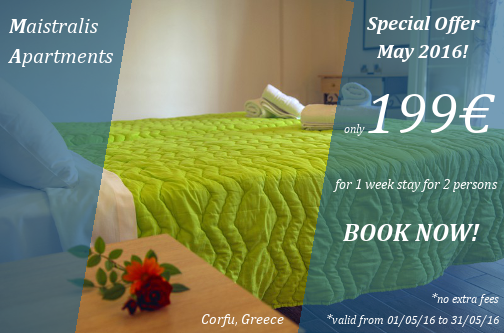 Offer is valid for stays from 01/05/2016 to 31/05/2016. Offer’s cost includes free use of WiFi and A/C and also housekeeping and change of linen & towels. In case you are interested please contact us through our contact form. Use “MAYSPECIAL2016” as a Subject and please do not forget to mention the Dates of Visit and the number of visitors.